Snow was falling over my garden this morning making a Desert Island Plant Challenge definitely one for the imagination. Yes, I'll suggest no limits to growing conditions whatsoever in this challenge! Purely for fun this one. Let's assume that there is food on the Island - will that make it easier I wonder. Would you like to join me on Thursday? 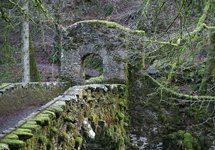 I’ll set up a link list for you to leave the URL of your posting on mine so we can share in our choices. I will try to invite as many bloggers as I can but if you could help me by passing the word around that would be great. Feel free to copy my photo below. No problem if you don’t have a blog either you can still take part by adding your choices as a comment to my posting - the more the merrier. I'm really looking forward to seeing everyone's plant selections and I am guessing at a few too! Perhaps you’d like a Bird Challenge? This weekend sees the 30th RSPB BIG GARDEN BIRDWATCH. Wow… Congratulations are in order here! I have to confess pre blog I had no idea this even existed. The RSPB is delighted: It may be our 30th birthday but we're only celebrating because everyone taking part has helped make the event such a huge success. It suggests: So go on, spend time with friends, family and children, put on your party hat, have a bit of birthday cake and enjoy yourself. This sounds like fun to me too. However, on a more serious note our garden counts really can help the RSPB with their records here in the UK. It will highlight species in decline and on the increase. Taking part is easy too. 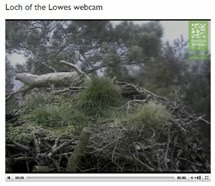 The RSPB goes on: For the last 30 years, the way we do the survey has remained exactly the same – watch the birds in your garden for an hour and record the maximum number of each species you see at one time. You really don't need to be an expert to take part. Whether you're young or old, an 'expert' or a beginner, there really is no better place to start than our Big Garden Birdwatch. I’d have to agree with that. It does also help having more than one pair of eyes when you are counting! You could consider when you do your bird count but don’t worry if you don’t see as many birds as you usually do. The RSPB says that with the huge amount of data they get it all evens out. However, I do appreciate it can be disappointing if you feel it doesn’t fully reflect the birds you usually see. 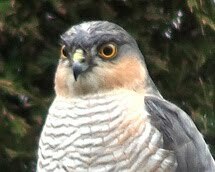 We had a Sparrowhawk visit last year during ours and it may well do again this year. I plan to do my count between 11.30-12.30am. Any earlier and I may not see the numbers of finches I can see on a cold snowy day like today so I am giving my count a chance to be accurate. The RSPB gives tips on their website and from there you can print a counting sheet which is very helpful too. Submitting counts can be done online which the RSPB encourages to keep costs down. However, you can also pick up the leaflet shown above. Overleaf you will find an address card to fill in and post to receive a Big Garden Birdwatch pack. Time is running out if you want to send away for one. Oh… but you might want to attend one of the events organised by the RSPB being held throughout the country. I am sure you will enjoy taking part. Oh... one last thing - you don't count birds flying over. Finally, if you can't see the online form on the website don't worry as they will open on 24 January 2009 for you to enter your 2009 counts. The RSPB will collate and publish the results in March 2009. From memory I think the results are out near the end of the month. 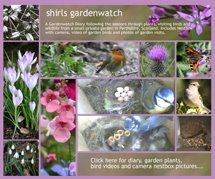 Enjoy counting your birds or choosing your plants! I'm looking forward to hearing all about them. Once again if anyone from outside the UK wants to join in with a bird count too please add them to my Birdcount posting. Have fun! Good deal, Shirl. I will send a few notes to people too. Frances sent me the word, so count me in! She is a real gem for bloggers!!! This is too funny too, because I had prepared a similar post, but not for food only. Can't wait to see the entries! I'll come back Thursday and post the url. This requires some thought. :) I'll be back Thursday! 1. Gunnera - I've always wanted one of these gorgeous plants, with their big hairy leaves. There would have to be lots of water as well... so lots of frogs/toads and newts hiding under it as well! 2. Ancient Oak Tree. If I could have an ancient oak tree on the island I could look for birds, fungi, bats, spiders and insects all day long on/in it's trunk and branches and I (and the mammals) could shade under it's dappled leaves. 3. Orchid. Perhaps I could get it to grow on my oak tree? The beautiful flowers would keep me smiling for months on end. I'll come back on Thursday! We also use same suet food. 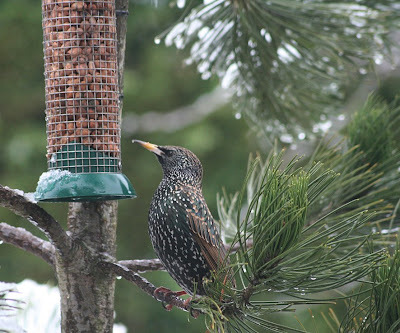 But you said you use a "suet feeder" that deters Starlings. That's what I need !!! Will go out today and see what I can find. Hi Shirl....I do the RSPB bird count every year. It really is important as you say. It shows them which species are increasing and which are in decline. Hi Shirl, with my, err,`official' RSPB hat on, thanks for covering the Big Garden Birdwatch, its looking good for a big turn out this weekend. 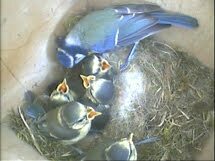 I'm just hoping our bullfinches put in an appearance. What a fun idea! 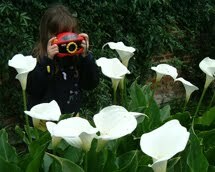 I am going to post your picture on my blog today! Now...I've got to get to thinking on what my 3 plants will be. Shirl, I thought I would never be able to narrow this down to three. Then I thought desert island - what about the plants I can't grow! So a visit to Meems at Hoe and Shovel, Florida and I have my three: Caladiums for the lovely big leaves; some Rain Lilies, I can't imagine not having rain regularly and lastly a Hibiscus. Now don't ask tomorrow it will all have changed! Very interesting Sylvia! Looking to see the other posts, the word is getting out. My plant post is ready to be posted tomorrow. I wonder what everyone else will choose. I guess (with me knowing less plants) that my job will have been easier than yours. I hope all goes well! A Wildlife Gardenr invited me! I shall come back tomorrow with my link! Thank you for hostessing this event. Hi Shirl .. it is Joy from Kingston. I really like this challenge and have posted on it. I was looking to where to link up but I must have missed it. Hope this is OK with you ? Thanks for the fun girl ! Hi Shirl! 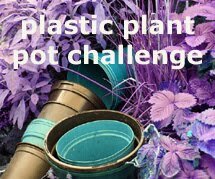 I have been reading about your Desert Island Plant challenge on so many blogs, I had to pop over and tell you what a great idea it is and that I want to play along too! I will post tomorrow (Friday, Jan 23rd). Do you think it will be any easier having overnight to ponder which three?!!! Thank you so much. I saw this on people's blogs yesterday, good idea. I'll join in late, posting today, but what fun to think about.